This was news two years ago but I only recently stumbled on this newspaper story by Ellie Zolfagharifard. This is the reconstructed face of "Beachy Head Lady", an 1800 year old skeleton found on a beach in East Sussex England. Scientists were able to reconstruct her head with 3D scanning and other techniques. 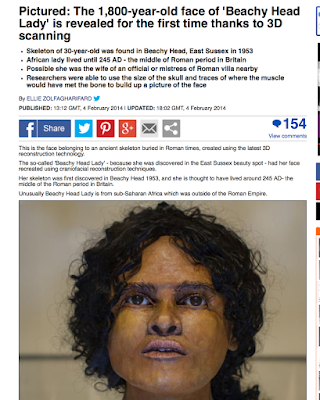 It is believed that she lived circa 245 A.D.